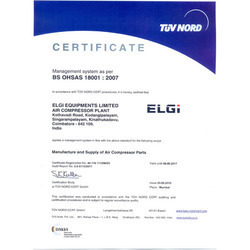 Incepted in year 1960, ELGI is one of the few companies in the world capable of manufacturer of compressor packages. The ELGI range of air compressors is one of the widest in the world. We manufacture Air Compressor, Piston Compressor, Oil Free Compressor, High Pressure Compressor, Diesel Engine Compressor, Portable Compressor, Screw Air Compressor and Air Compressor Accessories. Screw compression elements are manufactured in-house using state-of-the-art machining centers for rotor grinding and machining intrinsic castings of various sizes. Our own eta-V profile rotors deliver more compressed air while consuming less energy. ELGI manufacturing facilities are equipped with advanced, high precision rotor grinding machines, turning centers, CNC horizontal and CNC vertical machining centers. The in-house rotor manufacturing facility provides ELGI with unrivaled advantage over competition. The manufacturing unit is supported by the R&D division that leads the ELGI innovation program, a CADD unit with advanced design capabilities, an integrated machine shop and a metrology laboratory. Our manufacturing capability is further strengthened with the adoption of the ELGI Manufacturing System (EMS). EMS is customized lean management that has led to consistent productivity gains, quality improvements, on-time delivery and significant reduction in inventory. The delivery of better quality products with reduced time-to-market has positively impacted customer satisfaction levels. 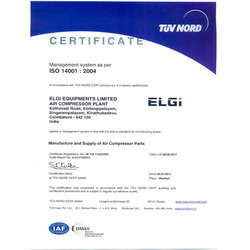 ELGI products bear the hallmark of quality and reliability. Every manufactured component and product passes through stringent quality audits and tested to ensure performance and reliability. Our manufacturing test rooms are atmospheric controlled. Under the efficient leadership of Mr. Thanikachalam S., we have established trustworthy and reliable relationships with our esteemed clients. Our state-of-the-art manufacturing facilities are in India, China, Italy and France. The Coimbatore plant is situated on a 89 000 m2 of land with a built-up area of 32 700 m2. Our company is an ISO 9001:2008 certified company. ELGi Equipments serves the global marketplace. Over two million ELGi compressors are powering business worldwide. The company offers a strong sales and service network, besides a well-knit distribution network worldwide. Well-trained and highly qualified engineers and technical experts manage our sales and service offices.The manufacturing facilities in India, China, France and Italy cater to various markets with products that suit the unique requirements of those markets. The warehouse facilities in Australia, Brazil, the Middle East and US support the growing sales, service and distribution network across the world. Our company is an ISO 14001:2004 Certified company. Our company is BS OHSAS 18001: 2007 Certified company. The ELGi Vision is the purpose that penetrates the length, width and depth of the organization. This gives forth the seven core Values, each having its own hue and meaning, but together creating the powerful and vibrant spectrum. These Values are nothing but the beliefs which is lived day in and day out to create a beautiful world within and outside of ELGi. A transparent and stable organization allows the Vision to penetrate at all levels with the same intensity and clarity, ensuring that every Value is followed and lived by everyone, with awareness and pride. QUALITY: Delivering consistent quality will earn stakeholder trust. The opportunities could be in terms of employment, investment, partnership or societal empathy. Whether it’s in the partnerships that we forge or the products that we design, we take pride in building long-term relationships with our stakeholders and making long-lasting impact in their businesses. 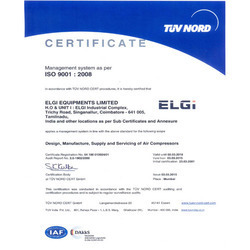 ELGi is today known for the reliability of its products, superior technology, manufacturing capabilities and values that stem from our core belief of making long-term investments and commitments.We are an ISO 9001:2008 company that has employed best-in-class practices and set up advanced capabilities to manufacture products to meet international standards. The company strongly believes in adopting good business processes and practices, and strives for continuous improvement to provide best returns to its stakeholders. Our customers and partners choose us because of our strong reputation for quality and service, and our tradition of reliability. ELGi employs 1562 people across the globe. There are 273 well-trained sales and service engineers, a 161 member team for R&;D and product development, and 500 people on the shop floor.Engineers are the most important asset of ELGi. There is constant encouragement for engineers to upgrade their skills. We have formulated schemes to help engineers pursue full-time higher education. We also believe in continuous learning and follow an internal mandate to put our people through an average of 5 days training a year.Our technical team has several engineers with master’s and PhD degrees and many of them hold patents. A culture of innovation and the freedom to experiment is innate in ELGi. We encourage our engineers to push the frontiers of technology in product development.Training is an integral part of continual improvement. To commemorate our golden jubilee in 2010, we established the ELGi Quality Institute (EQI). EQI imparts training to ELGi employees and small and medium manufacturing companies that supply components to ELGi. The main objectives of EQI are to manage growth with focus on quality, maximize customer satisfaction and enhance competitiveness through continual improvement. In the future, ELGi will extend the EQI facility to SMEs in and around Coimbatore.